A community meeting will be held Wednesday night at the SCI-Arc building in downtown Los Angeles from 6:30 p.m. to 7:30 p.m. to discuss the Metro Red/Purple Line Core Capacity Improvements Project (Division 20 Portal Widening & Turnback Facility). This is the project that will allow subway trains to turn around substantially quicker on the eastern side of Union Station, meaning more Red/Purple Line trains can be run in the future and the extremely annoying crawl into and out of Union Station will be eliminated. To put it another way: at present, trains run every 10 minutes on both the Red and Purple Line during peak hours. The project would allow trains to run every four minutes on both lines. That means that trains could be running as often as every two minutes between Wilshire/Vermont (where the Red and Purple Lines split) and Union Station. To repeat: trains carrying passengers would not have to switch tracks while entering and exiting from Union Station. 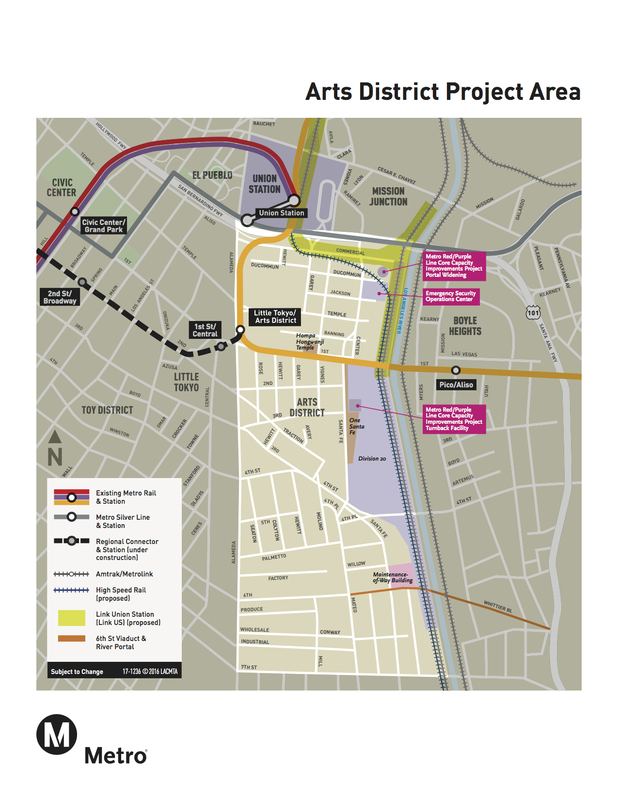 We are also aware of another issue important to the community: the possibility of adding new Red/Purple Line Stations to serve the Arts District, where many new real estate projects are being built or proposed. To emphasize: Metro staff say that the turnback project could still accommodate a possible station between 1st and 3rd streets. A station at 6th Street would present more serious challenges, among them acquiring real estate and finding a way for trains with passengers to travel through the existing subway car maintenance/storage yard. In both cases, the stations would need to be studied further, funded and approved by the Metro Board of Directors. 7 p.m. – Presentation – This presentation will begin at the start of the regular HCNC UD/LUC meeting scheduled to take place from 7 – 9 p.m. The location is served by the Metro Gold Line Little Tokyo/Arts District Station. Parking is also available. Plan your trip to the meeting at metro.net or by calling 323.GO.METRO (323.466.3876). All Metro meetings are held in ADA accessible facilities. Spanish and Japanese translation and other ADA accommodations can be requested by calling 213-922-4465 at least 72 hours in advance. In order to accommodate increased service levels on the Metro Red/Purple Lines, Metro is planning critical facility improvements including a widening of the heavy rail tunnel south of the US-101 freeway (Portal Widening) and a new turnback facility (Turnback Facility) in the Division 20 rail yard. With these improvements, new tracks and switches will allow trains to turn around more quickly at Union Station. Presently, the Metro Red and Purple Lines carry over 140,000 passengers each day and ridership is expected to grow by 49,000 when the Metro Purple Line is extended to the VA West Los Angeles Medical Center (as described in the Final Environmental Impact Statement for the Metro Purple Line Extension). Many Red/Purple Line trains switch tracks before entering Union Station, which is the reason that some trains operate more slowly coming in and out of the station. This project will allow switching to take place after riders get on or off trains. It will also help to ensure safety and reliability on the system, a sufficient capacity to serve future passengers and a more effective operation of Metro’s expanding subway network. It will also be available online at metro.net/capitalprojects under “Reports and Info”. The deadline for public comments on the IS/MND is Thursday, January 19, 2017. For more information, visit metro.net/capitalprojects or contact Bronwen Keiner at keinerb@metro.net or 213-922-4465. This is really interesting. A station at 3rd behind One Santa Fe would be sorely needed for the denser developments in that area, but it would probably only work well if Metro can squeeze an easement out of the One Santa Fe developer to connect the station to the street just south of 3rd and Santa Fe. A lot of Metro stations suffer from the problem of poor interconnectivity with surrounding neighborhoods and there’s a good opportunity here to do it right. If further studies need to be performed for the 6th street station, then those studies need to be started now. The area around 6th street is undergoing rapid development and is very poorly served by transit. If a station is not even in the works, the development will create a hostile space and add thousands of cars to DTLA’s streets. A station needs to be in the long term forecast to allow the development to count on it’s opening down the road. And, by comparison, how is the current turnback situation at the North Hollywood station? That’s a good question. I don’t ride enough to NoHo to know off-hand. Any readers know? Even if it isn’t great, the purple line does not go to NoHo, so only half as many trains will ever have to use it. Union Station is more troublesome because both the purple and red line need to turn around there. Thanks Steve, I’ve always HATED that crawl in/out of LAUS. The turnback facility is desperately needed, but I hope they can find a way to do it with 3rd AND 6th street Arts District stations, which this plan does not presently accommodate. There’s an opportunity for a creative solution, as you don’t need LAUS-level headways at either of those two Arts District stations, so have the red line serve one and the purple line serve the other. Then, turn one back at 3rd and turn the other back at 6th. Virtually nobody is going to be trying to go from 6th to 3rd or vice versa, and the few who do can still transfer at LAUS (and put up with two turnback operations). A further thought; I recommend serving 3rd with the red line and 6th with the purple. 6th will directly serve the new LA CleanTech Incubator on Hewitt and Palmetto, and a purple line connection will offer nonstop connection to the WLA business/investment corridor. Just a thought. How would trains access the 6th street station in this proposal? If they have to pass over the tracks that leave to the 3rd street station then having one line 3rd and the other serve 6th isn’t going to save any time or improve capacity at all. It might be possible to have all trains serve 3rd street but then only half of them serve 6th with a pocket track for the trains that are turning around, but again it would likely need a flying WYE to get the trains going out of service out of the way. In simple turns… The new tracks serve as a turnback slider?